Charlotte Coliseum | Crockett Foundation - Tag In & Help Out! 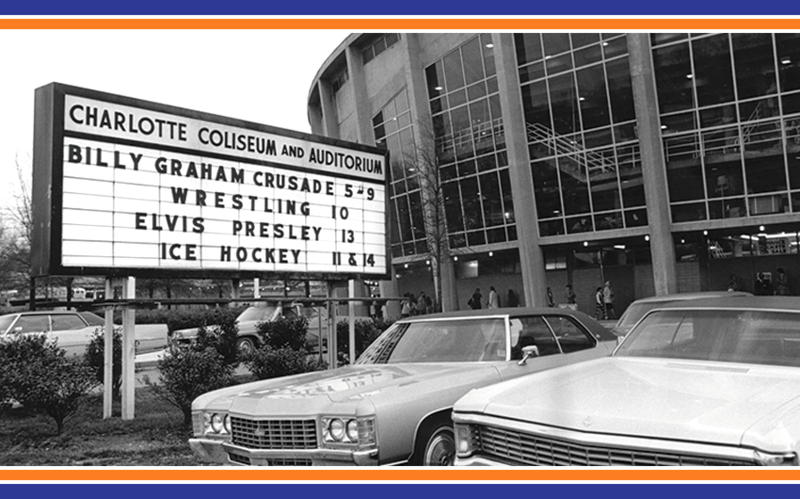 There were some things that were a staple in Charlotte, NC and one of them was wrestling at the Charlotte Coliseum. By the time the coliseum was built in 1955, Jim Crockett was a veteran in the promotional business. He also was looking for ways to give back to the community that had treated him so well. He decided that all of the proceeds from the annual Christmas night matches would go to Charlotte area Non-Profits and it would be donated anonymously. Pro wrestling was still evolving into the giant of an industry it has now become but that didn’t keep Big Jim from clearly see the future. He made the Charlotte Coliseum a home away from home. Jim and Paul Buck, the first and only general manager, of the new show piece in the Queen City became fast friends. It was not at all unusual to find them sipping on adult beverages at the end of a wrestling match, concert or hockey game going over the success of the evening or brain storming over what could have been done better. Jim even had his own “office” in the building. The “office” was actually a meeting room with long tables. He would sit in the room and listen. Listen to what the crowd was doing. Clapping or booing. It all meant something. Sitting in this room listening was the way Jim honed his craft. He could tell by not only the gate but also the reaction of the crowds as the matches progressed. He always knew that in bad economic times fans needed someone to hate. In the good economic times the fans needed someone to love. As more and more of his shows were booked at the Coliseum, his office also became a family meeting place. When his grandchildren were old enough, he would let them go out into the crowd alone much to the horror of their mother, Frances. His only response would be “It’s a circle. They will wind up back here.” Jim would give the grandkids a few dollars to get some type of snack but they always came back with not only the snacks but more money than they had left the office with much to Jim’s amusement. He must have wondered how far that skill set would take them in the world. This is also where the evenings bantering would start between the older grandchildren and the wrestlers. There was always someone that needed to try to one up the kids which was no easy feat even at their young age. The primary out of ring goal of Ole Anderson or Wahoo McDaniels was terrorize these kids. The primary out of ring goal of the kids was to not give them any ammunition. No one could find out you had a friend sitting in the second row or all of Ole’s famous smack talk into the ring would be directly in the face of said friend. No one could find out you had a boyfriend standing against the Coliseum wall watching the main event or they would get more than their far share of attention during the Wahoo’s walk to the ring. But it really didn’t have to be something or someone new or different to spark this unwanted attention. After a long night of selling t-shirts, Jim’s cherished grandchildren could be standing and waiting on the match to be over so they could go home, and out of nowhere would come a bloodied wrestler with another one in tow coming straight at them. In these instances, in true Crockett fashion, these kids would simply step aside and not react at all to what had just happened. Let’s be honest, there’s only one way these kids could keep these huge egos they were surrounded by in check and that was not react. These wrestlers had huge egos and wicked sense’s of humor, yes, but they were some of the best friends a kid could have.